One day, my little guy will get too big *sniff, sniff* for his nursery and we'll have to send him off to the guest room. While this is not happening anytime soon, the guest bedroom does need a dresser for our guests. I figured that I might as well plan ahead and get a dresser that will eventually be for my son to use. 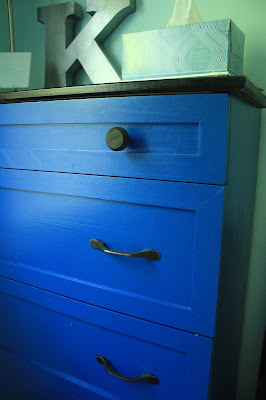 Keeping with the nautical theme that we used for his first birthday party, I've decided to hack an Ikea Tarva dresser to match this someday, nautical-themed, kid's bedroom. Now, there are A LOT of beautiful Tarva updates all over the internet and I decided that the "framed" drawer was my favorite update. 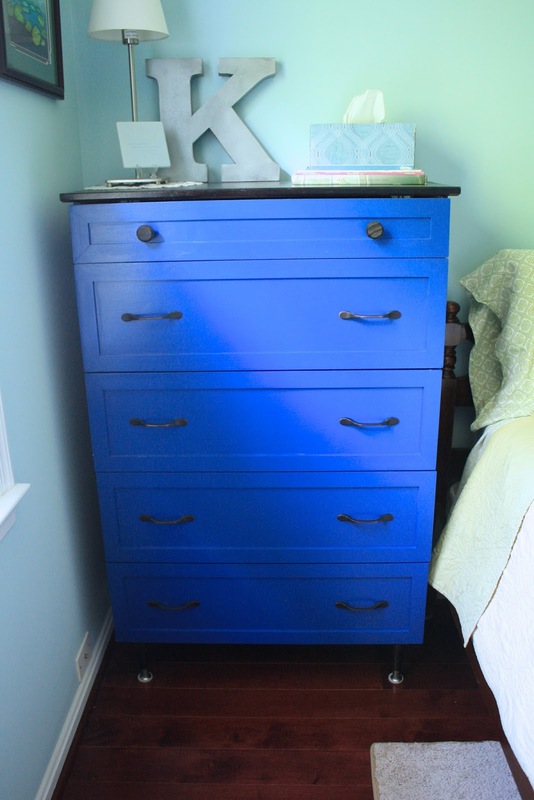 This very simple dresser looks much more put together when the drawers have that small update. This project was a big project for me, as I'm not familiar with painting furniture. Sanding, priming, sanding, painting, waiting... I'm just not that into it yet. Buuuut, I figured I'd go out of my comfort zone to see what I could do. I figured that it would be easier to frame and paint the drawers before assembling the dresser, so that's where I started. During my online research of painting Tarva's pine wood, some people came across problems with the knots still leaking a bit of sap through the paint. My favorite (former) DIY bloggers, YHL, presented a solution to this minor problem. 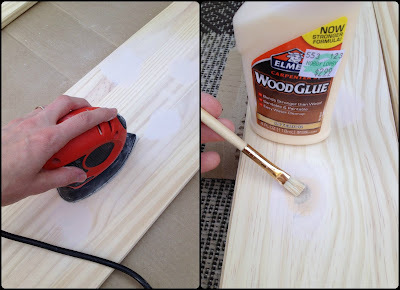 First, cover knots with wood filler, let dry, sand, then paint a thin coat of wood glue on top. This should help seal those knots and keep them from seeping. 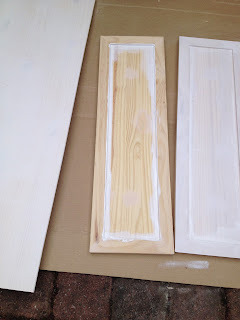 They also noted that you could probably skip that step and use a shellac-based primer instead, but apparently there are more fumes, so I decided to do the filler/glue route as well. While the filler and glue dried, I cut my furring strips with a hand miter saw that my neighbor let me borrow. This little machine is pretty darn cool and VERY easy to use. This was my first time cutting wood for a project, so using it wasn't intimidating like a big, electric miter saw could be. As well experienced carpenters say, measure twice and cut once ! Then I sanded the corners and used liquid nails to attach the frame to the front of the drawer. I used clamps, weights, and books to keep it together and weigh it down. I filled in the corner cracks with wood filler. Once everything was painted and dry, I put together the dresser...this was the WORST part. I do remember thinking this was the hardest IKEA piece to put together. I wanted different handles for the dresser, so I purchased some sleek thin ones from Lowe's, but I did use the original knobs for the top drawer (I also stained those with the walnut stain). I purchased these legs in 6" height to give the dresser a different look. I stained them to match the top of the dresser. AND, I forgot to order the leg plates when I ordered the legs. 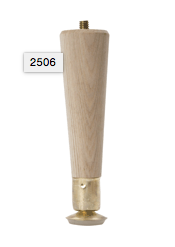 Luckily, Lowes had the exact ones from Waddell that I needed. And, in the search for the leg plates, I found that Lowe's carries the legs as well...wish I'd known that before I paid for shipping! Annnd...since the legs were not compatible with the dresser, I needed to attach a piece of wood to the bottom of the dresser to make a base for the leg plates to screw into. For both the top of the dresser and the bottom flat piece, I put two coats of dark walnut stain and one coat of polystain. After attaching the piece of wood with the leg screws and an extra five screws, the dresser was ready to stand up ! I love how it turned out ! I probably won't be painting any furniture any time soon, but at least I can say I've tried it! Any new IKEA hacks from you guys? Now you can Do It Yourself, Too ! I'm baaaaack. Yea, its been a while...sorry...again. Keeping up with my little guy sorta keeps me busy ! My latest project makes me all giddy inside. Its a simple project that I've thought about doing for a while and I just bit the bullet and completed it. Back in the day, I used to babysit this boy who had a HUGE chalkboard on a wall in his kitchen and I just loved it. He loved it too...but I think I loved it more. It was good for coloring and learning. 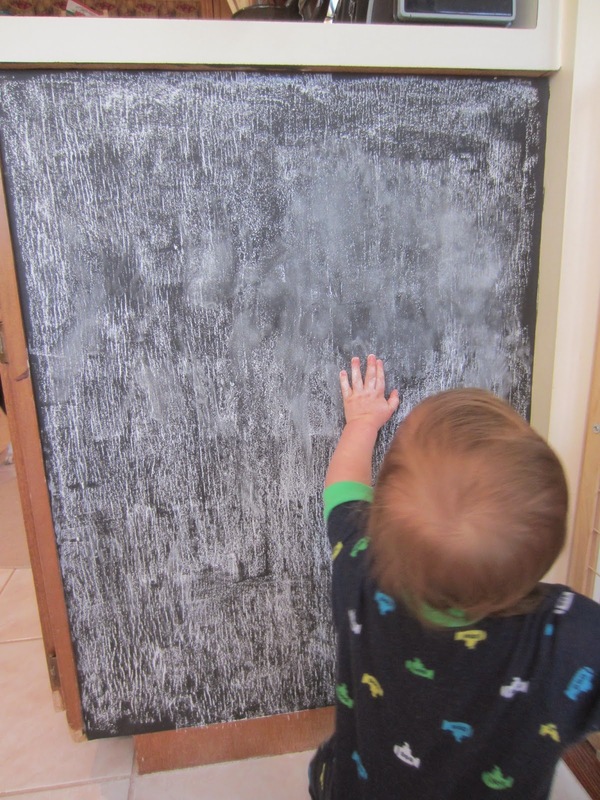 Now, my little guy isn't quite old enough to enjoy a chalkboard yet, but soon enough, he'll be making marks all over my painted walls the chalkboard wall. I thought about putting the chalk paint on a blank wall we have in the kitchen, but decided to go with just a small area and use the side of our cabinets. I purchased my Rustoleum chalkboard paint at my local Ace Hardware store, but any home store (or Amazon) has it. Everything else I had on hand to paint the cabinet. Its best to use a small foam roller. I also ended up using a small craft paint brush (not pictured) to cut in the corners and edges of the cabinet. This project was so easy that waiting for it to dry was the hardest part. 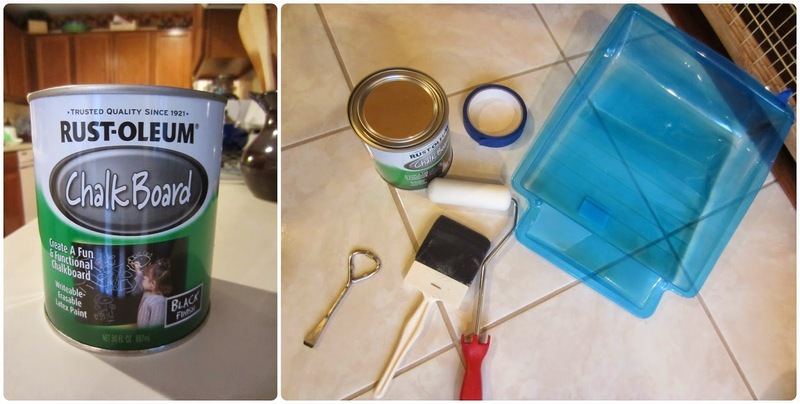 I followed the directions on the paint can as guidance for the chalkboard. 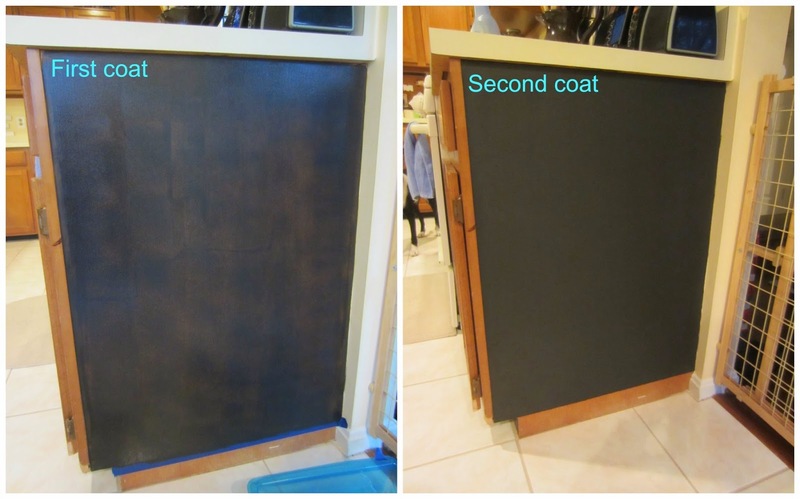 I cleaned the cabinet surface, painted two coats (I used a fan to help it dry faster) and conditioned the chalkboard (more on conditioning a chalkboard below). The can did say to wait three days before conditioning...I waited two...oops, I'm a rebel. It seems to be fine, so we'll see down the road. I never knew that you had to condition a chalkboard before. Heck...I didn't even know what conditioning a chalkboard was about! Conditioning prevents your board from having permanent marks. All you do is cover the whole board with the side of the chalk and then wipe it down using an old rag or paper towel. 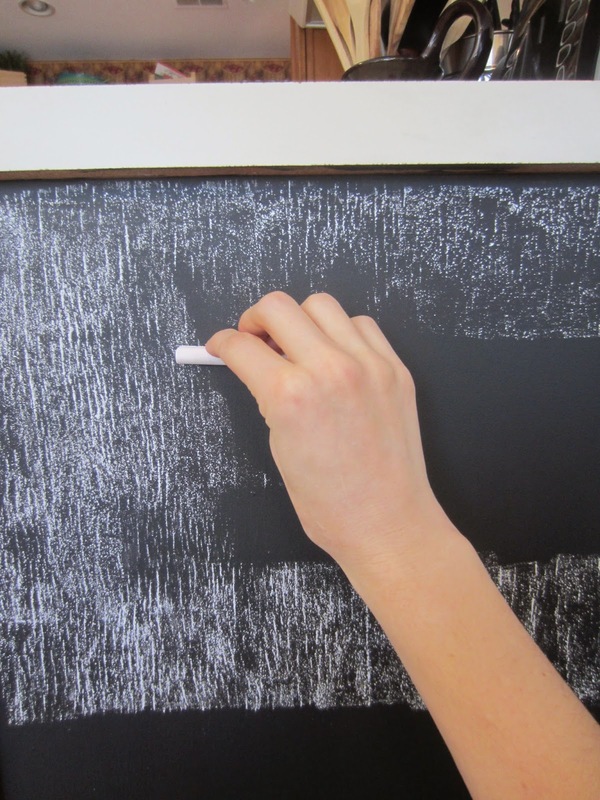 Remember the days of cleaning the chalkboard with a wet sponge? Nope. Don't do that. After I conditioned the board, I wanted to add a place to put the chalk. I saw the most adorable idea like this, using a drawer pull turned upside down to hold the chalk. I went to Lowe's and picked up a nice-sized drawer pull (similar to this) and went to work. And I take back about what I said earlier about waiting for the chalk to dry as being the hardest part. This simple task was a pain in my you-know-what at first. I wanted to screw it into the cabinets so I actually attempted to drill holes into the cabinet. That was an epic fail due to the fact that I really couldn't reach the spot where I wanted to drill. I did drill holes, but then couldn't get the screws in...it was a mess. I ended up using rubber cement glue and just glued it on. I bet liquid nails would work just as well. And looking back, I wish I would have put it near the top right corner, that way my little guy couldn't get to it. Right now its empty because he's always trying to eat the chalk (along with anything edible looking) Otherwise, I love it ! I know that chalk boarding everything is pretty popular now, but I think that it's a classic and we'll always be able to use it. 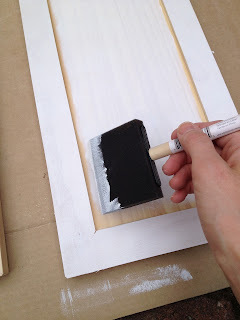 Now, in my search for the paint, I also saw that you can prime it with a metal-type paint and it will be magnetic. That would be pretty neat for those magnetic Alphabet letters and numbers. And there is also a dry-eraser paint that can make things like a wipe board and you can use markers on it ! Who knew this stuff was out there?! I love it and I can't wait til my little guy can draw pictures and write his name on it. But for now, I'll be the one having fun with it. 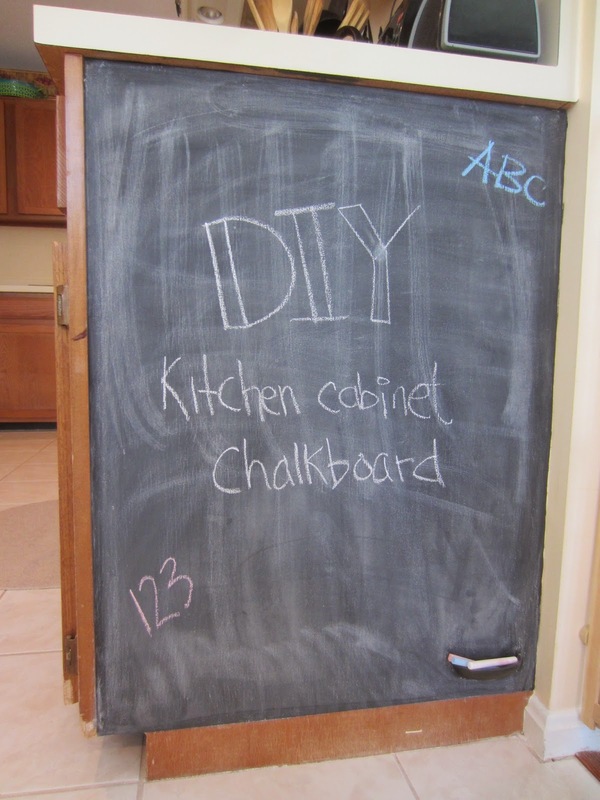 Has anyone used the magnetic chalkboard paint? Or the dry-eraser paint? I decided to give it the ol' DIY try and make my sister one of these for her birthday. This was a trial and error project, with lots of trial and lots of errors. Bare with me while I try to explain. I first purchased a French corner wood plaque from Michael's craft store. The size was 11x14 inches- a perfect size for words and hooks. I painted it with craft paint I had around the house. Then, I used my Cricit (I seriously love that thing !) to cut out the word "Runner" with sticker paper. I stuck the stickers on the painted plaque and then, the first error hit. As I went to paint over it with Mod Podge to give it a nice shiny seal and finish, the letters got soggy and started to peel up AND the Mod Podge was going on clumpy (I guess that's what you get when it is 12 years old). So I hurried and peeled off the letters and smoothed out the Mod Podge. I had to paint over it again to help smooth it out. It worked! Then I figured, I'd use a clear sealing spray paint and then put new sticker letters on it. My spray paint came put clumpy as well !! That was it. I gave up and decided to start over. No salvaging it now. How bad was it? So bad that I didn't even bother taking a picture. I've saved your eyes from the horribleness of it all. I went back to Michael's (coupon in hand, of course! ), and sadly, they were out of the French corner plaque, so I just got a regular rectangular one. It's just a little less fancy, but the size is still perfect. I mixed up my paints again and painted it a pretty blue/teal color. Once it was dry, I sanded the edges to "frame" the plaque. I think the sanded edges gives it a nice look, especially on the French corner plaque version that didn't turn out so well. After the edges were sanded and the paint was dry, I took white letter stickers and placed them near the top. I eye-balled the letters to make them centered. A ruler could help with this. Once I smoothed on the letters as best as I could, I took my NEW Mod Podge and gave it a nice clear coat. No clumps this time! 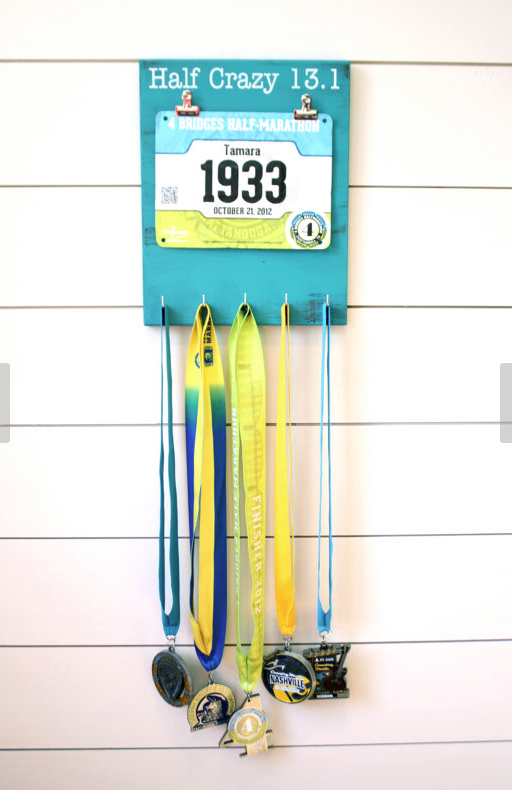 For the hooks, I used cup hooks for the bib part and the mug hooks for the medals. I took one of my smaller bibs as a guide for where the holes should be. I took a pencil and marked the holes. Then I used a drill to start a tiny hole for me to screw in the cup hook. 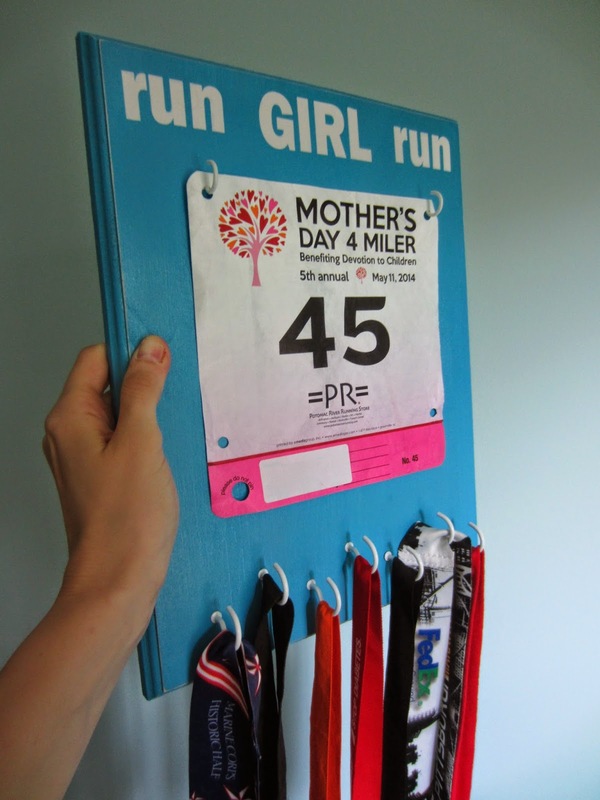 Not every bib will be exactly the same size, so you may end up needing to hole punch some of the bibs to hang properly. After that, I made seven holes for the mug hooks. I decided to stagger the hooks to give it a different look, but you could make the hooks in a straight line as well. Once the holes were started, I just pushed and twisted the hooks until they were tight. To make it hang on the wall, I used a ruler to draw a straight line for my saw-toothed frame hangers. I nailed both in and voila. Done ! 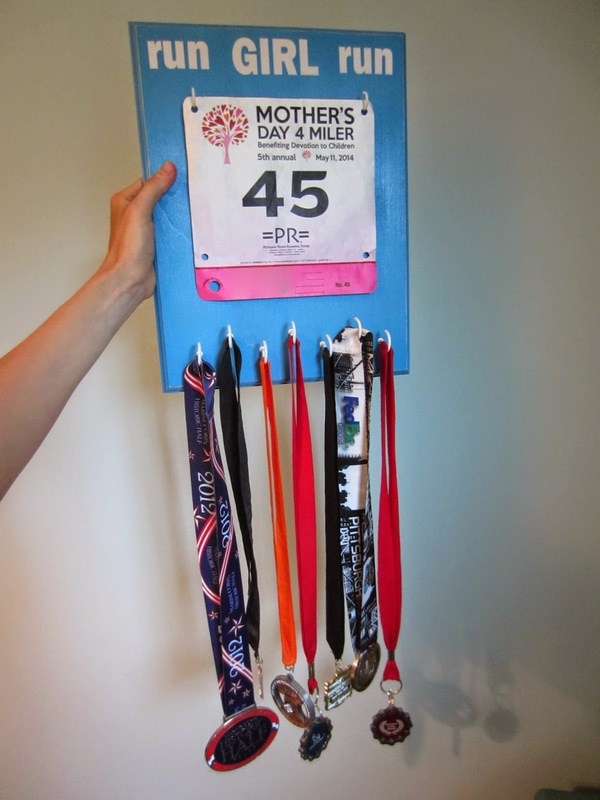 I tested it out with some of my medals and bibs and it looks AWESOME ! My sister loved the gift and it is currently hanging on her bedroom wall...already pretty much filled up. Go Em ! What other ways do you display sports memorabilia? Shadow box? Shelves?